IFTF intends to run some kind of convention (or conference) for lovers of interactive fiction, narrative games, adventure games — all the forms of story-forward interactivity. Join our mailing list for more info! If I handed you one of these flyers, I immediately added “Planning is in a very early stage.” We don’t even have a name for the thing yet! 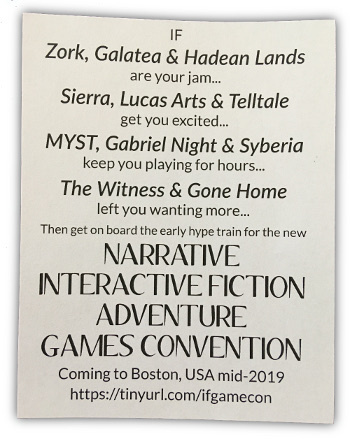 (“Narrative interactive fiction adventure games convention” is unwieldy and has a terrible acronym.) In fact, I’m still wavering between calling it a “convention” or a “conference”. Or a “conferention” maybe. We will do this. In Boston. Sometime in the summer of 2019. We’re aiming at June but that could slide around. We are a small group of collaborators, mostly from the Boston indie-dev scene. We have not yet formed up as a committee or decided who is carrying what role yet, so I will leave the names for a future announcement. We intend to welcome all sorts of interactive narrative: Twine, parser games, point-and-clicks, visual novels, graphical adventures, experimental hypertext. There are a lot of disconnected “IF communities” these days — many of them don’t even think of themselves in those terms, but they’re still exploring the world of narrative games. We’d like to be a place where they can all get together and talk. This will be an event for both creators and players (and people who are both!) That’s why it’s both “convention” and “conference”. We’ll probably lean towards the indie side of the spectrum, since giant companies already have their own conferences. Our intention is to be affordable and welcome a diverse range of voices. We will have program content from game designers you admire and also designers you’ve never heard of. We want to make this an annual event. Having said that, I acknowledge that not everything about our plan is going to be ideal the first time out. The first (2019) conference will be limited in size. This is IFTF’s first real-life event. We want to approach it conservatively and scale up over time. “Boston” and “affordable” are not words that go together smoothly. We apologize for that. Our core group is mostly Boston-based, and we know this area best — there’s no practical way we could run the event in a different city. Maybe we’ll pick a different city for 2020. For that matter, my country’s policies are currently unfriendly to visitors from abroad, and actively hostile to visitors from Muslim-majority countries. Some conferences are reorganizing outside the US until matters improve. I support that idea, but again, it’s not practical for us the first time out. We intend to keep these issues in mind and look for ways to mitigate them as our experience and resources grow. It’s all a year off, so we don’t have any more info for you yet. But if you’re interesting, please join this mailing list to receive news and announcements. The list will be low-traffic — no more than a couple of posts a month, usually less. If you’re interesting in helping with the event, please drop us a note! We don’t have tasks for volunteers yet — as I said, we haven’t even figured out our own roles yet. But we will stay in touch as the conference plan progresses. Thank you for your interest in interactive fiction! And adventure games, interactive narrative, and all the other terms that get used.